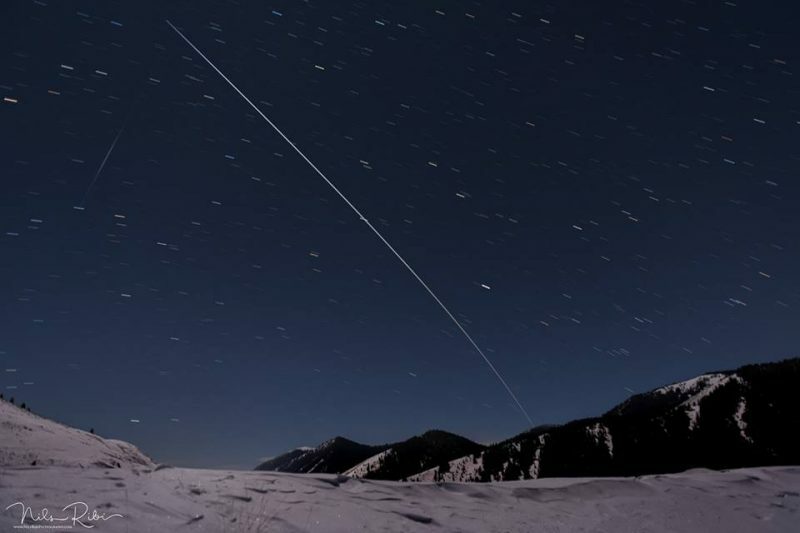 On a cold January night, Nils Ribi captured the path of the International Space Station (ISS) in the southern sky over the Wood River Valley of Idaho. Last night [January 25, 2018] the International Space Station (ISS) flew over the southern sky of the Wood River Valley of Idaho for three minutes from 7:27 p.m. to 7:30 p.m. I was able to capture its path in six 30-second exposures … that I combined into this one photo. The clear sky and a bright waxing gibbous moon at 65% full made for a nice show. And an iridium flare from a satellite below the ISS was a nice addition. For help spotting the ISS in your night sky, go to NASA’s Spot the Station. Bottom line: Photo of the International Space Station (ISS) crossing the night sky over Wood River Valley, Idaho.